Kay- those jet pilots are a breed of their own. I worked on the military housing and the jets would approach Hickam from the 180° direction, then make a sharp u-turn and decend to land from the right direction, the next jet right on the tail of the earlier one. Sorta like driving through an aerial cul-de-sac except pulling some G's on the turn. What a sight. I think the second photo has beed edited. I don't believe that a plane can fly that close directly behind another plane. Also the clouds got proportionally bigger. 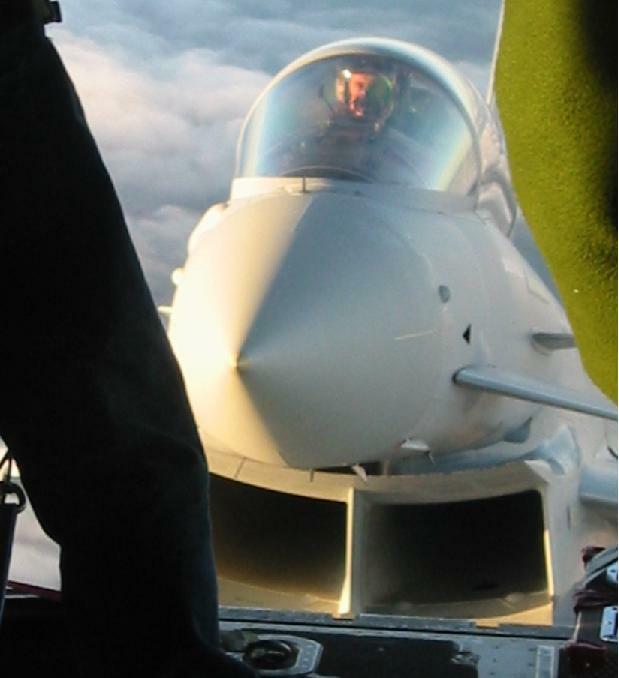 Anonymous- it's footage from an RAF recruitment video taken over an actual typhoon. Video no longer available on YouTube. Here's a larger size of the same photo. The reason the background clouds appear "proportionally larger" is from that angle they're nearer clouds themselves. 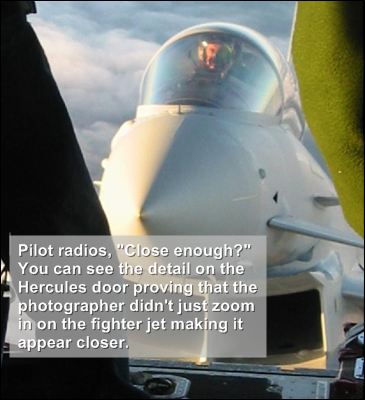 In the linked photo, you get a better idea of the foreshortening effect and it's impossible for the level of detail on the open door to remain in focus if the camera was on zoom. Wow! What a shot, Ron! Cloudia- haven't been by the yacht harbor all this year yet. The next time I'm there, I'm the one with the fog horn. What's with the background to the right of the veritcal stabilizer (rudder)? That landing procedure must be an AF thing. At Kadena AB on Okinawa, the F-15s first overfly the runway, then make the 180 degree G-turn you describe, then fly back out to past the end of the runway, then make another 180 degree G-turn back to land. I've noticed the landings by the F-15s at Hickam. Do the new F-22s do the same thing? "What's with the background to the right of the veritcal stabilizer (rudder)?" I'm not working near Hickam now, so don't know about the Raptors. Wow. 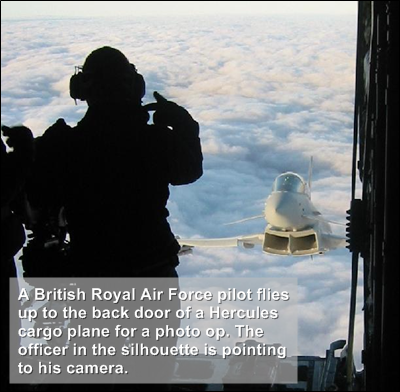 It's hard to believe planes could get that close to one another! Amazing shot. Mokihana- they're actually synchronized the speed to zero differential, but still. Others have said that the jet's intakes are like powerful vacuums, so the people taking the video must have tied everything down, including themselves.